Heading into the 4th….we were just coming off of Grace's hospitalization and all that that entailed….which also meant…no getting into water and doing some outside/summer type things for a week. 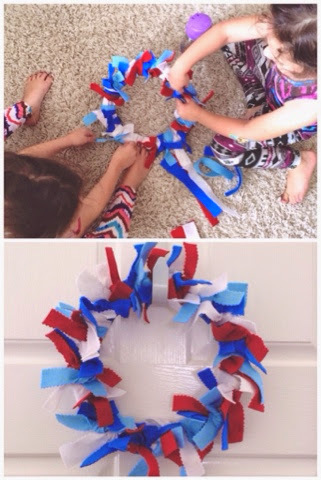 So for some indoor fun…we did some 4th of July crafting. 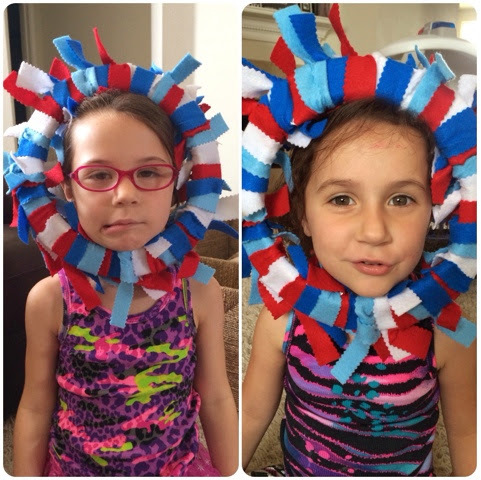 The girls really enjoyed it, as we really haven't done much crafting since school got out….or even before that. I found this idea here….where they did this on a shirt…but we just did this on white construction paper. I was very impressed with Parker…as she figured out all on her own how to make dots in a line…and then string them together so she wouldn't run out of paint. Grace was doing pretty good…. …and then she was done. Pipe cleaner fireworks. Idea found here. And then cookie-cutter painting. Idea found here. Then I just let them free-paint. And the girls did this fun wreath. A paper plate + felt strips = this…. I also hung up this cute paper bunting just for fun. And we're ready for the 4th!